Two buses heading back from a field trip were involved in a crash on Route 3. Eight people were taken to a hospital after two charter buses were involved in a crash on Route 3 in Duxbury, Massachusetts. The crash happened around 3:20 p.m. on Route 3 southbound just south of exit 11, state police said. According to fire officials in Duxbury, the buses were taking students from an elementary school in Brewster back from a field trip to the Boston Museum of Science. Seven students and a teacher were hospitalized with minor injuries. There were 95 people on the two buses. A car was also involved in the crash. Seven people were taken to a local hospital Wednesday afternoon after two charter buses were involved in a crash on Route 3 in Duxbury, Massachusetts. Children were huddled under blankets as another bus was brought in to pick them up. 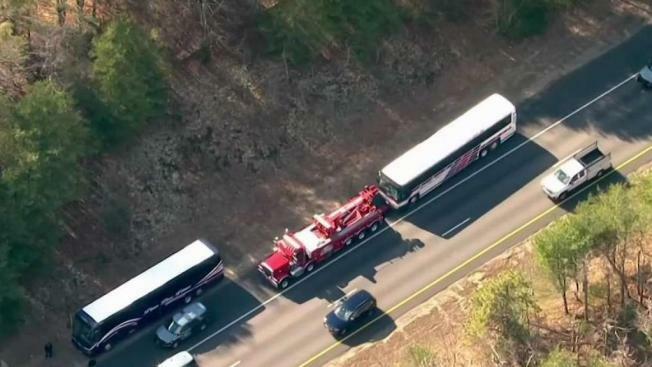 Video from NBC10 Boston's Sky Ranger showed bus passengers on the side of the road as first responders attended to their needs. NBC10 Boston has reached out to the bus company for comment.